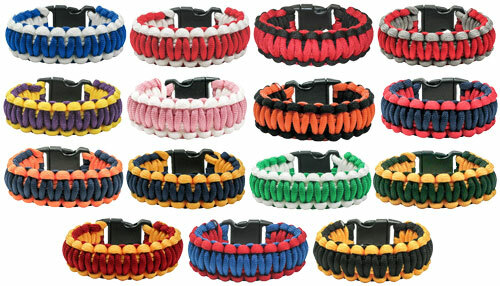 Colorful Survivor Bracelet Survival bracelets are very useful and fashionable, and made from sturdy materials. Unravel the bracelet and you have a handy all-purpose rope. Perfect for Girls or Guys looking to be fashionable yet practical! One Size Fits Most ... Bracelet measures 8.5" Long and 1" Wide. 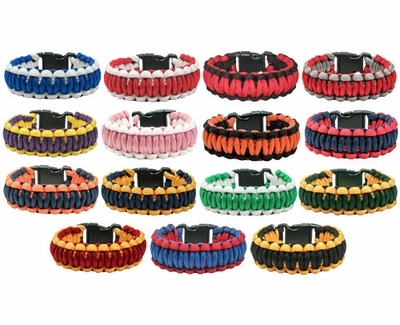 Paracord Bracelets possible uses include: � shelter lashings, � tourniquets, � fishing line, � marking a trail, � catching food, � repairing shoelaces or backpack, � and just for looking good! Available in 15 popular team Color Combinations: � Royal Blue / White, � Red / White, � Red / Black, � Red / Grey, � Purple / Gold, � Pink / White, � Orange / Black, � Navy Blue / Red, � Navy Blue / Orange, � Navy Blue / Gold, � Green / White, � Dark Green / Gold, � Burgundy / Gold, � Royal Blue / Red, � Black / Gold. I got one for an accessory when I wear my team colors yellow for Warriors. I also have one for my SF Giants which is orange and black, and you never know when the rope may come in handy being ex- Army it might be worth it. Prosvariety of colors, useful for emergencies, light weight looks good feels good.